My students will soon embark on a multigenre research project on a British author of their choosing, and I thought the best way to help them see what a good final product should look like would be to create one myself. Which author I would choose was not even up for debate: Jane Austen. Specifically, I decided to examine Jane Austen in modern pop culture, especially since the release of Pride and Prejudice starring Colin Firth and Jennifer Ehle in 1995. The project involves conducting research, including a traditional research-based essay with MLA citations, but it also includes other genres that enable students to explore what they have learned about their topic—these can be anything from art to creative writing to video. 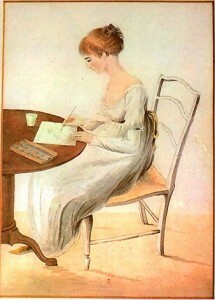 Students will need to include four such artifacts One of my artifacts is a letter from Jane Austen to her sister Cassandra about a curious vision she had while visiting their brother Edward Austen-Knight in 1813. I liked the end result and decided to cross-post it here. I have experienced a most curious and illuminating vision, and I know not to what to attribute my fancy that it might actually be true, or I should say shall be true at some time in the future. Only I feel this conviction that it must be true. After we dined yesterday evening, I had a headache and so went to lie down. It soon grew dark, and I felt my head must burst. I took a small glass of wine, but it did not help, and so I lay down again. I must have fallen asleep, for I can account for the vision in no other way, but I chiefly remember feeling that with my head aching so I should never sleep. I know not how to account for what I saw, for here were not the familiarly bound copies published by Egerton, but at least six different editions I have never seen before. My name appeared on all of them, and how I was discovered as the authoress, I cannot fathom. The publication information was most bewildering. One book named a publisher called Bantam and was dated 1983, of all preposterous things. However, the most marvelous edition included an image on its cover that looks like your very own work: the watercolor you painted of our Fanny. I should have fainted, but I recollected Sophia’s dying words to Laura: “Run mad as often as you chuse, but do not faint.” I opened the book, and I should mention these books had most curious paper covers that seemed to me not as sturdy as one should wish. The words I had written were on the page, just as I recollected. On the right side, the pages consisted of some explanations. As though anyone might need an explanation of what a curricle is! It was most curious to me, and I thought to ask the bookseller his opinion, but somehow I felt fearful of doing so. Next to Pride and Prejudice, I found copies of Sense and Sensibility, but most curiously, a copy of Mansfield Park. Dearest Cassandra, you of all people know I am yet writing this novel, and how it came to be in print, my words with some editorial alterations to be sure, I cannot fathom. And yet I saw also a novel called Emma and another called Persuasion. Also Northanger Abbey, which appears to be my story of Catherine Morland under a title I did not recognize, that Mr. Crosby cruelly had not printed and would not return. Miss Catherine on the shelf at long last! I confess it, Cassandra—I wept for sheer joy. The bookseller appeared around the corner and asked if he might be assistance, and I hastily dried my eyes and thanked him. “Do you like Jane Austen, miss?” he asked me, and I could not think how I should reply to such a question, but assured him I did, very much, and he led me to a display in the window, and I cannot explain how I did not see it as I walked in the store. Several books with Darcy, and Bingley, and even one with wicked Mr. Willoughby’s name on the cover. “But what are these books?” I asked the bookseller. He said they were Jane Austen “sequels.” I know not what he meant by that, and I felt somehow embarrassed to ask, as though I might reveal my ignorance. I picked up several and read, and some I found curious, while others I frankly hated. One was so unspeakably villainous that I could feel my face redden from embarrassment as I read it. I should not like to think I could have imagined such goings on, though I admit it was rather “fun” to read, as my Lydia might say. In fact, I have no doubt in my mind that Lydia would heartily enjoy such trash. I have no more understanding what he could have meant than you do, Cassandra, I am sure. “If I may, sir, why does everyone love Jane Austen?” I asked him. He said something about a gentlemen called Mr. Firth. I know not who this Mr. Firth is, but it would seem I owe him a great debt of gratitude and asked where I might find him. The bookseller nearly choked laughing at me. I left the bookshop and was frightened to discover it was dark. I was alone and without a chaperon, and worse, I was lost. I must have wandered for nearly an hour when I came upon a box-shaped shop called “Blockbuster.” A large notice in the window advertised a new “Restored Edition” of Pride and Prejudice available in something called “DVD and Blue-ray.” I went inside and inquired after the Pride and Prejudice and pointed to the notice in the window. “Throwing a Jane Austen costume party?” the proprietor asked. Confused, I shook my head. He shrugged his shoulders and showed me where I could find Pride and Prejudice. Imagine my surprise to find Mr. Firth’s name on the cover. I could not open it, as it was wrapped in a strange clear substance. I asked the proprietor what to do, and he said I would need to “buy it.” I need not say I had no money. I turned to a large box with a screen of some sort. I watched until the end of story. The proprietor asked me if I was going to buy the “DVD,” and I confess I could not have spoken at that moment. My surprise and happiness were so great, dearest sister, that I felt my heart must surely burst. “Lady, are you OK?” the proprietor asked. I know not who OK might be, but assured him that I was no such person, thanked him, and began to leave the shop. Before he left he said I looked like I could use a cup of coffee and asked if I might join him, as he was closing up the shop. I need not tell you, dearest Cassandra, that I was utterly shocked at his forward suggestion, but as I was lost and utterly bewildered as to what I should do next, I agreed. We walked to a shop called “Starbucks” which advertised a variety of coffees and teas. He asked me what I would like, and I simply could not chuse and asked that he might chuse for me. As I waited for the drink to be prepared, my eyes fell upon a newspaper with the most curious date: May 1, 2010. I began to feel faint, and I must have done so, for I awoke here in my bed in dear Edward’s house with Fanny leaning over me and shaking me awake. She asked me if I were quite well, and I knew not how to respond. She said Edward worried about me when I did not come down to breakfast. I think must be ill, but I do not feel it. My head no longer aches, nor do I feel any pains whatsoever. I pulled my ms. of Mansfield Park out and set to writing, and do you know, Cassandra, I think, nay, I am quite sure it shall be a success. All About Me, Me, Me! Thank you very much, Jenny. Enjoy the letters! Dana, I really enjoyed reading this post! I think you captured Jane Austen's voice well. I've just started reading Persuasion, and I am always so charmed by Austen's wit! Thank you, Sara! Persuasion is my favorite of her novels.